Finally, one thing on your schedule you can control. Jiffy Lube® provides the information you need to take control of your vehicle's preventive maintenance requirements, like when you should change your motor oil. With the right preventive maintenance, today's vehicles can stay on the road and out of the repair shop longer, and Jiffy Lube® is here to help make sure that happens. Jiffy Lube was one of the first in the quick-lube industry to make the same manufacturer recommendations for service and maintenance that your dealer uses. With locations easily and conveniently available, Jiffy Lube allows you to choose the oil change schedule that best suits your needs and driving conditions, and know that it’s completely in line with what’s recommended for your vehicle. Choosing your Oil Change Schedule is easy. 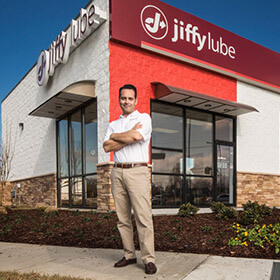 Just stop by your local Jiffy Lube® service center when it’s convenient for you. You never need an appointment. At Jiffy Lube®, we'll share your vehicle manufacturer’s recommendations and review your personal driving conditions. Then we’ll discuss how normal and severe driving conditions can affect your oil change service interval. Finally, we’ll advise you on what oil change interval is recommended by your vehicle manufacturer so you can choose the customized Oil Change Schedule that works for you and your vehicle. If you choose to register for a Jiffy Lube Dashboard account, it gets even easier — you’ll find your decisions reflected in the service history and recommendations. We always look for new ways to make it easier and more convenient for you to take good care of your vehicle and Leave Worry Behind®.